The Discovery Scholars Program is a funding opportunity that aims to increase the diversity of our graduate student body. This program provides funding for students admitted from the GEM database to the Colleges of Arts and Sciences and Engineering MS or PhD programs. The fellowship provides a monthly stipend, tuition and fees, and health insurance. Students receiving the fellowship are guaranteed continuous funding for the remainder of their degree up to two years for a MS and five years for a PhD. The fellowship program provides professional/ career development, social events and mentoring. When applying to an Ohio State University graduate program, it is critical that you submit your application by the fellowship deadline (ex. December 13) in order to be considered for a university fellowship. 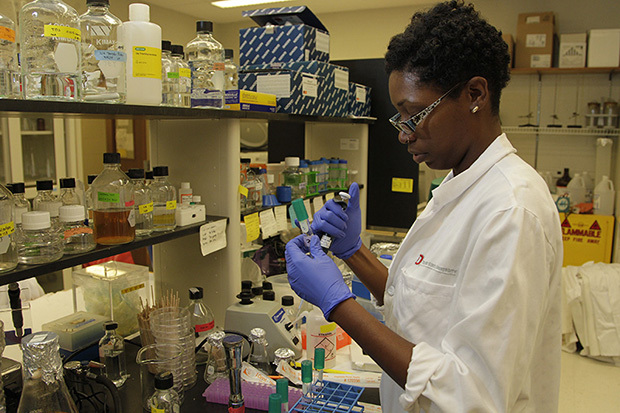 Programs are able to combine university fellowships with the Discovery Scholars fellowship. Note that some programs may have differing deadlines. Please check the graduate program list and under each discipline, click the ‘apply’ tab to see the funding application deadline. An application fee waiver will be provided for all eligible students looking to apply to the Discovery Scholars Program. Visit the College of Engineering to explore participating engineering graduate programs. In addition to the numerous scholastic opportunities The Ohio State University has to offer, the campus is situated in beautiful Columbus, Ohio. Just last year, we were named the number one best opportunity city by Forbes due to our extremely affordable cost of living and a high number of young professionals among many other factors. For those of you who are interested in visiting campus and seeing Columbus first hand, please consider applying to partake in our Graduate and Professional Student Recruitment Initiative. For more information, please contact Brian Orefice, Assistant Dean for Graduate Studies, orefice.1@osu.edu.